With V Festival this weekend and Reading and Leeds just around the corner, this is a quick guide to make sure you can carry on looking your best all weekend long. If you think your friend just so happens to look amazing in her festival photos with her flowery headband and wellies without a speck of mud on them – you’re sadly mistaken. 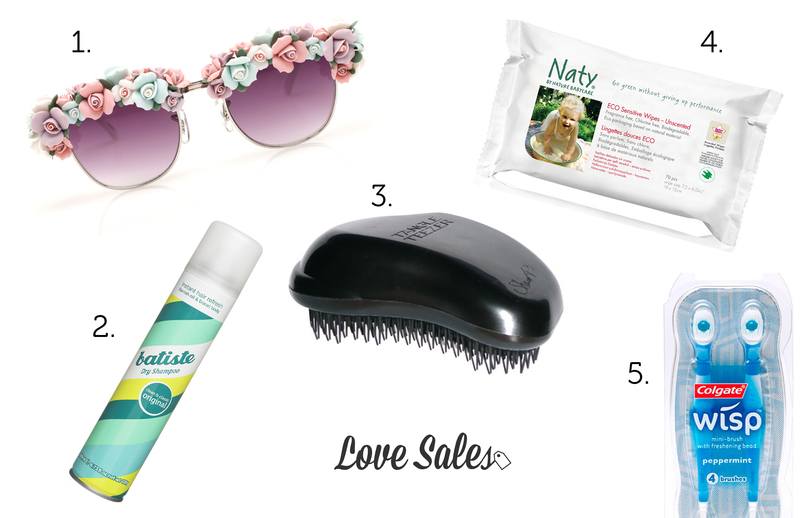 Here’s a rundown of our top 5 essentials that you need to take with you to any festival to stay looking and feeling fresh. Okay this isn’t so much of a cosmetic essential but when you have panda eyes after awkwardly trying to apply your mascara in your tent they come in handy. It’s also customary for festival goers to wear sunglasses rain or shine so you won’t look out of place. Not only does it make your hair look clean, it gives it volume too! This becomes a godsend in the morning when your hair is looking a little limp and greasy. This lovely brush is small and combats all those pesky knots you may have obtained while headbanging/raving/whipping your hair back and forth. It even works on wet hair which is great if there is a sudden downpour or you manage to find the shower. It cleans, it removes make-up and it make you smells nice. If you can’t shower at your festival you NEED them. We recommend biodegradable because you’ll be using them a lot. You can try and bring your usual toothbrush along but your morning routine is so much easier with a disposable one. The main thing is to just enjoy yourself! Hopefully you’ll be having too much fun to care that you’ll most likely get muddy, rained on, lose your tent and stepped on whilst dancing, but it will be worth it. Plus, much more bearable with our handy list. What items would you add to your festival essentials list? We’d love to hear from you! Leave a comment or tweet us @lovesalesdotcom. This entry was posted in Trends and tagged Blogger, cosmeticproducts, Festival, festivalessentials, festivallist, ReadingandLeeds, Vfestival on August 14, 2014 by Charlotte Williams.